Few things are more intimidating than preparing your first Thanksgiving turkey. Staring down a frozen block of bird can send the inexperienced cook straight to the nearest restaurant. 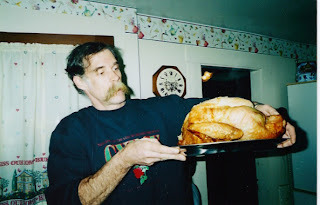 Or perhaps you are an old hand at turkey roasting but your bird doesn’t always come out tasting the way you want. Here are a few helpful tips on preparing this holiday’s main attraction. Let’s start with the basics. When buying a turkey, choose one that allows for approximately one pound of bird per person. If this means purchasing one 24 pounds or larger, consider buying two smaller birds to cut down on the cooking time. It is also a good idea to check ahead of time to be sure a large bird will fit in your oven. Of course, if leftovers are important (and when are they not) buy a slightly larger bird than needed. Give a frozen turkey plenty of time to thaw. 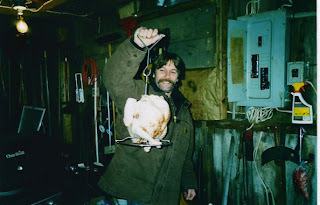 The best way is to place the bird in the back part of the refrigerator, allowing at least one day of thawing time for every four pounds of turkey. If time is short, a quicker method is to place the still-wrapped bird breast-side down into a sink or large container and cover with cold water. It will take about 30 minute per pound to thaw a whole bird, and you will need to change the water every 30 minutes to keep things cold. A roasting pan and rack large-enough to hold the bird. Disposable aluminum pans will work fine. Just be sure to set the pan on a cookie sheet to give it added stability. Also, in place of a rack, the bird can go on top of cut-up roasting vegetables (onions, carrots, celery, parsnips, etc). This will keep the turkey elevated while also flavoring the pan drippings. Kitchen twine for trussing, which allows the bird to cook evenly and keeps it looking nice. Many cookbooks give instructions on trussing, which may seem a bit complicated. All that is really needed is to tie the legs together. An instant-read thermometer to take the guess work out of when the turkey is done. To prepare the turkey for the oven, cover your work surface with plastic wrap or waxed paper to keep it free from contamination and for easy clean-up. Then rinse the bird inside and out, and pat it dry with paper towels to insure the seasoning sticks to the skin. Turkey is traditionally roasted at 325 degrees with the oven’s rack placed in the lower third of the oven. Coat the rinsed and dried bird with butter or oil to keep it moist and promote browning. Then sprinkle with salt, pepper and your favorite poultry seasoning. If you are not stuffing the bird, then place a quartered onion, celery and carrots inside the bird before trussing to help flavor the meat. If you are worried about a dry turkey, cover just the breast with foil to keep the meat moist, and then remove 45 minutes before the turkey is scheduled to be done to allow the breast to brown. Another idea is to rub some softened butter mixed with your favorite herbs under the turkey’s skin. Just be careful not to tear the skin while separating it from the meat. 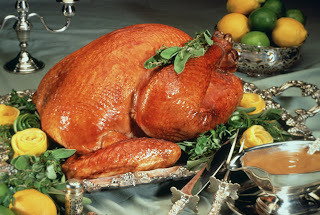 If you plan to stuff the turkey, it is important to do so just before roasting to prevent any harmful bacteria growth. Do not prepare the stuffing or stuff the bird the night before. Also, be sure the bird is completely thawed and do not tightly pack the stuffing into the turkey. It takes approximately 20 minutes per pound to completely roast a turkey, a little longer if the bird is stuffed. Start checking for doneness 30 to 45 minutes before the scheduled finish time. This is where an instant-read thermometer becomes essential. The turkey is done when the thermometer reaches 170 to 175 degrees in the thigh (away from the bone) and 165 degrees in the breast. Also, the juices should run clear. If the bird is stuffed, the center of the stuffing needs to be 160 degrees. After removing the turkey from the oven, allow it to rest covered with foil for 30 minutes before carving so the juices redistribute back into the meat. When the meal is over, what about the leftovers? First, be sure to take the meat off the bone and remove any remaining stuffing within two hours of roasting. Then wrap them separately and refrigerate to use within three days. Leftovers may also be frozen for up to two months. Just wrap the meat and stuffing in foil, place in zippered plastic bags, and freeze. That way you can enjoy a little bit of Thanksgiving whenever you like.